Charlie Blair looks back at EUCR-W (UKU Nationals) and forward to this weeks xEUCF 2013 in the Women’s division. This year’s Nationals finished just as expected, with all of the teams seeded in the top four comfortably claiming their spot at the xEUCF finals in Bordeaux. However, amongst the top four, there was a distinct lack of upsets. Particularly after Tour 3 had somewhat wetted the appetite for some tight results and big shake-ups to the status quo. Perhaps with no real challenge required to assure qualification for Euros, these teams were not forced to push themselves in a way that one would expect Nationals to demand. In fact, both Bristol and SYC have admitted they are disappointed that they under-performed during the weekend, especially against Iceni. Indeed, neither team were able to take any more than seven points off of the eventual champions. But Cesca Tyler is adamant that SYC ‘definitely have much more to give’ against the teams they finished behind. Indeed, their performance against Leeds is testament to the way that their captain knows SYC have the potential to play. It was undoubtedly the highlight of the women’s division at Nationals. SYC played beautiful, fast paced offence. Their cutting was incredibly confident. With their flow so difficult to shut down they took a six point lead early on. Even in the face of a stoic Leeds resistance, they kept themselves in the game until universe point, where they eventually emerged victorious. Word from the Leeds leadership is that very same game was the best of their whole season so far. Indeed having gone six down and then rallying to score eight consecutive points to take the half is one of the most impressive comebacks of the season. Yet despite failing to take any big scalps, Leeds should be particularly proud to have produced the tightest scorelines amongst those who qualified. Especially since their already predominantly youthful team, lost further experience, most notably in the form of Tash Nishiyama to the mixed division. Having come within three points of Bristol also, Leeds were the only team who looked likely to threaten the seedings. Even the match up between Bristol and SYC, 2nd and 3rd seeds, didn’t prove to be as close a contest as either of their games with the fourth seeds. 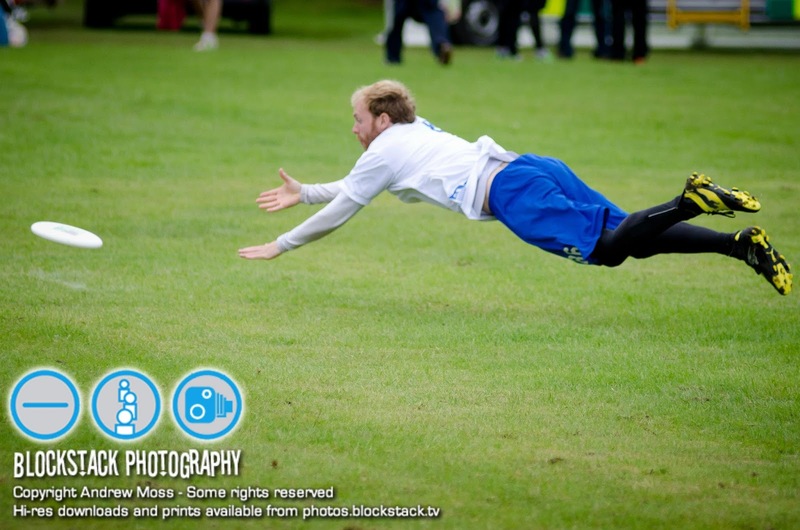 SYC vs Nice Bristols at UKU Nationals 2013. Photo courtesy of Patrick Ward. Iceni on the other hand ended up finishing the domestic season as they had started it, with a pretty clean sweep at Nationals. Back to an almost full strength squad after having split the team for Savage during Tour and lost others to international duties, they held a strong margin of difference throughout the final against Bristol, closing it out at 15-6. Despite both teams employing notably stricter line calling, both showcased the talents of their newer, developing players. In particular, of those returning from u23 World Championships in Toronto. The sibling connections between the Owens was a potent force for the Bristol O line. Equally, Renny Norman, shone on the Iceni D line displaying such confidence and pace you’d be forgiven for thinking her doppelganger teammate, returning World Games star Jackie Verralls, was playing every point! Despite the scoreline, Bristol did not go down without a fight. If given the chance to play expansively, they often profited with some lovely scores that involved very few passes. The start of the game however was plagued by longer points generated by an awful lot of turnovers from both sides. Iceni were able to stem Bristol’s flow by heaping up the pressure on the sideline trap. Bristol’s preference to look for the IO resulted in point blocks for both Lauren Bryant and Alex Meixner on the Iceni D. Nevertheless, the Iceni offence also struggled, particularly from leading discs being thrown beyond their receiver and out of the pitch. It was eventually Iceni’s patience to favour the around that allowed them to start taking away the game with their first five points all a result of throws to solid under cuts in the endzone. Looking forward to Europeans then, how are the British contingent likely to fair? Heading up the summit of the four pools are Cosmic Girls (Russia), Iceni (UK), Ultimate de Cologne (GER) and Lotus (Switzerland). Iceni will be returning to defend their title, very conscious of sending a message to the rest of the teams attending the World Club Championships of what to expect from the UK number one. Significantly, they are definitely taking the biggest squad in the women’s division to Euros. Iceni after winning UKU Nationals 2013. Picture courtesy of Philipa Sturt. Captain, Ange Wilkinson, is particularly wary of the Russians (Cosmic Girls), notably on the ascendency after their victory at ECBU earlier this year. Equally Lotus are expected to again bring great fight, after two ‘tough but rewarding games’ against the Swiss last year. As for the Germans, whilst this may be their first European Championships they do not lack in talent or experience. Even though this team has replaced Woodchicas as the premier German representation, Cologne has rehomed its most influential playmakers. Both Bristol and SYC have their eyes set on the second qualification spot for Worlds, which would require them to finish as the highest seeded British club (excluding Iceni). Both are eager to match up against some European opposition and to escape the repetitiveness of the domestic season this year. Unfortunately, as one would expect, SYC’s seeding leaves them witha tougher route to the top eight. Whilst Tyler anticipates a gritty match up from the likes of Hot Beaches, the Czech outfit were noticeably weaker than in previous years at Windmill, missing their twin sister playmaking pair. However, this still leaves them with Lotus and Lemon Grass to better. On the other hand, Bristol should expect to at least hold seed in their pool since first time qualifiers Lay D’s, although bulked by one the aformentioned Hot Beaches sisters, are reportedly unable to take their whole squad. Despite a strong performance this season from their young side, the Leeds leadership still recognise that the aims for this tournament are very different from the ones of the side that made the finals of xEUCF 2009. In direct contrast to that squad, the majority of Leed’s current roster has not met European opposition outside of fun tournaments. However, here’s hoping after getting so close at Nationals, they do manage to take down some strong teams. Like, for example, pool opponents Prague Devils. They have won the Central European League twice already. However their team makeup is also significantly youthful and athletic, and are too, reported to suffer a dearth of experienced handlers. I believe all the British teams have the strength to finish in the top eight. Rising to the challenge of Europe is something that all these teams need and desire. Thus, I am so thrilled that all four of them have the opportunity to do so. At this stage of the season, the British contingent should be making no excuses to not be reaching full stride in Europe. Since one can only speculate what to expect, there is everything to play for, in contrast to another somewhat predictable domestic season. The British should be ready to show Europe and beyond their full potential. If they do, we will see great results! The confidence that a strong performance that xEUCF can give our clubs is crucial to the future of women’s ultimate in the UK. With only 4 days left until #xeucf2013 we are very excited! More re-previews to come …. DP @ tSG. Charlie Blair previews Women’s Nationals 2013. With British clubs having been awarded four spots at xEUCF in the women’s division this year, it is a great shame that there isn’t an improvement upon the number of teams that competed at Nationals 2012. A further disappointment is that only four teams who consistently finished in the top half of the women’s tour this year have chosen to attend. The most obvious absence is that of PUNT. Having had such an impressive season, completely un-phased by the more established opposition or indeed by the loss of leadership in Lily Huang and Lucy Barnes, they steadily climbed the rankings at tour, eventually finishing 3rd in Cardiff. Naturally, one would hope they would be hungry for a final come Nationals. However, the majority of this team, a team who had laid down the foundations to be real contenders in Europe this year, are instead representing in the mixed division. by the simultaneous staging of Mixed Nationals. Indeed, forcing players to make the choice early as many of the women on PUNT clearly did is what the growth of the mixed division needs. However, was this early commitment motivated more by securing the opportunity of playing at xEUCF rather than a simple preference for the mixed game? The ShowGame would be eager to hear contributions to this debate, not wanting to rely on my speculation alone! Nevertheless, the fact remains that Iceni, Bristol, LLL and SYC are likely to walk away with xEUCF spots pretty much uncontested. Not to discredit Dragon Knights or Curve, but with the former finishing Tour 15th and the latter not even fielding a team at any of the events, they have not demonstrated European ambitions. So what exactly are we competing for at Nationals? Rest assured, none of these teams will allow what should be the most competitive event on the calendar be relegated to a somewhat farcical formality. 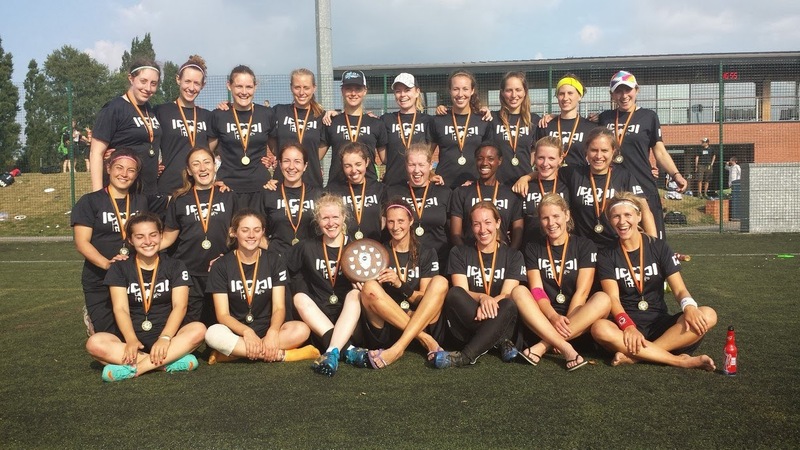 Pride at this stage of the season is priceless of course, but the real prize this weekend is the coveted WUCC qualification that victory at Nationals secures. Iceni have a lot to prove having been categorically dethroned by Bristol at Tour 3, who defeated the Londoners by a large margin. With a huge roster, it is clear Bristol are heading to Southampton intent on monopolising on this momentum. With all their u23 players now all playing together on the first team, they could prove to have some dangerous connections upon return from Toronto. Iceni, still missing captain Bex Forth, needs to continue drawing upon their depth in order to reassert their dominance. The last meeting between the two teams left a significant amount of fire in the belly of both, rendering a Bristol vs Iceni final as the most likely outcome. 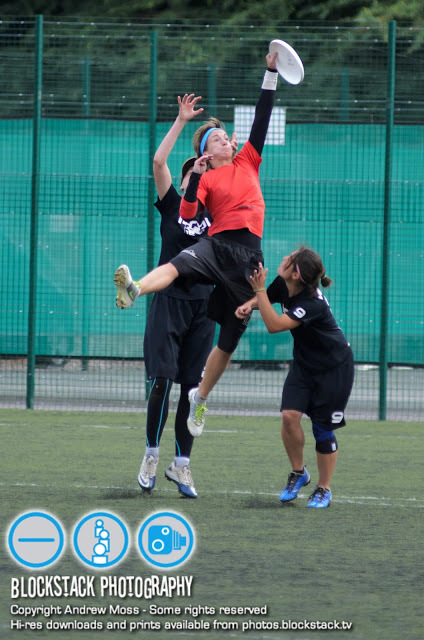 Priscille Lesne get high over Iceni defenders in last years final but will this year be a repeat? Photo courtesy of Andrew Moss. Yet, in no way does such a prediction serve to write off SYC or LLL from the top two. Both are bolstered by returning World Games players, Jenna Thomson and Sophie Edmonson, respectively. For SYC, Thomson’s return is indeed a welcome one, with captain Amie Channon recently moving abroad. Hopefully, SYC will be able to regain their usual confidence that seemed to lack somewhat at Tour 3. Again, returning u23 links should be exploited, particularly since both Carla Link and Ruby Rennison owned GB’s stats table. Equally, an extremely talented youth is at the core of LLL’s success this year. With Edmonson’s direction, they will punish any team that dares to underestimate them. However, their inexperience relative to the player base of the other three may get the better of them under pressure. With a round robin format, there is absolutely no margin for error and no second chance to gain a place in the final. Every game should be treated like a final. No matter who looks good on paper, you need to show up to every game at Nationals. … and it has begun! Look out for Mixed and Open Previews. Please comment below on the blog or FB. We want to hear your opinion on the Nationals debate! We will be trialling the Ultiapps score reporter, you can also follow all the action on the official mobile Nationals stats page. DP @ tSG. Dale Walker tells us how he thinks the Northern region will pan out this weekend. The North has 2 bids to Nationals and will be held this Saturday. With the introduction of the Regionals/Nationals structure to UK Ultimate over the past few seasons, the UKU has taken a glance across the pond to find a structure that allows for a flagship event to be created whilst encouraging local teams to come out and see the best in their proximity battle for the privilege of representing their region at the National Championships. Whilst thinking about how best to introduce the Northern region and to truly describe the dynamic we have, my mind glanced across the pond as well for inspiration. Whilst not the learned observer I have been in years gone by, I still keep an eye out on the blogosphere and ultimate outlets to see the latest trends – where the talent is heading, who are the top contenders in USAU etc. – and whilst thinking of a direct comparison my attention swung to 2011 NW Regionals. David Sparks makes a bid for LeedsLeedsLeeds at T2. Photo courtesy of Andrew Moss. This particular tournament featured 4 of the best teams in the country at the time, battling for 2 spots to Nationals in a hugely under seeded region based on regional trends over the previous years. Revolver were at the peak of their powers – Kittredge, Cahill, Watson, Sherwood et al – and dominated the Regional and National scene. Sockeye had come off a very strong regular season, and were being heavily tipped to take the second berth to Nationals. Furious have been notoriously slow in the regular season and didn’t look tooled up to keep Rhino down, nevermind knock Sockeye out. Rhino (with the addition of Seth Wiggins, Chasing Sarasota era) had come off their best ever year and threatened to break the monopoly the afore mentioned trio had enjoyed. Revolver took the Region. Furious knocked Sockeye out. Furious had beaten the bookies, and despite not coming close all year had taken them down when it really mattered. First off, I am not drawing a direct comparison in terms of ability between the North of England and the North West of North America. The comparison lies in a region with 2 berths and 4 teams fighting – whilst one spot might be sown up, the latter is completely up for grabs and is 2012 taught me anything it’s that no-one is safe from the dark horse. Chevron have been a powerhouse over the past few years in Northern ultimate. 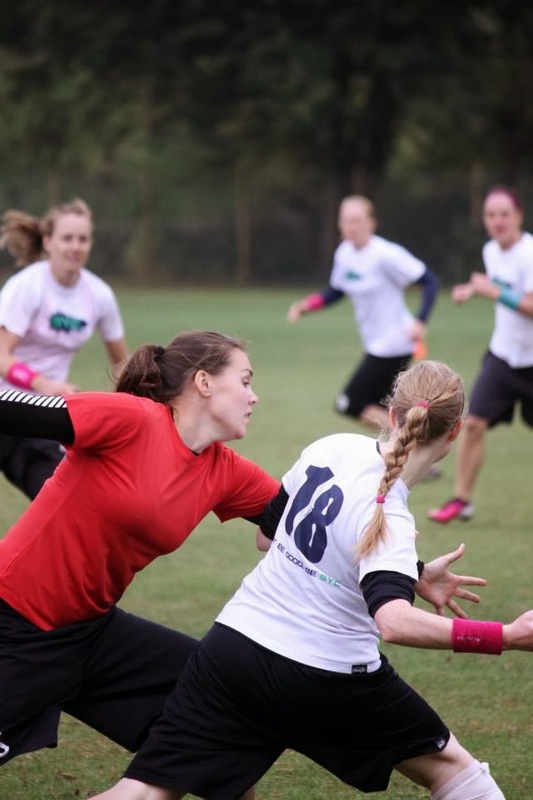 Their population is more diverse these days, featuring players from Manchester, Liverpool, London, Leicester, Leeds, Bristol, Exeter but the ethos remains the same – gritty, athletic ultimate with an explosive game based on dominant cutters. With some of the old guard moving on, Chevron have revamped in recent years and boast no fewer than 9 GB U23s in the Open team returning from Toronto. Lead by the Chevron veteran Matt Beavan and ably captained by 2010 U23 captains James Jackson, Mark Penny and Josh Coxon Kelly they will look to use Regionals as a tune up event having featured for the past 7 years in the top 4. Expect them to take the region comfortably. Manchester Ultimate (the rebranded ManUp) have similarly rebooted their programme this year with an active focus on becoming the competitive arm of a hub of UK ultimate. Training weekly since October focusing on skills and fundamentals, Manchester were able to secure an 11th place finish Tour 3 having been promoted from B Tour earlier in the season. Losing in sudden death to KaPow and Ranelagh showed that this team can compete at the top and they are laying claim to be the dominant force in the North. Expect to see Adam Irving rip a few hucks to Nick “Bambi” Smith and Santiago Zuluaga make plays on both sides of the disc. Lead by captain Ewen Buckling bringing a humble intensity to the D line, with Sion Regan and Ben Brierley making explosive plays to keep the D line in with a shout against any team. Having been part of the exodus from LLLeeds to Manchester between 2012 and 2013, this writer feared they may struggle to recover from the blow of losing 5 starters to Manchester. Leeds have done a superb job of starting from scratch and working with local talent to create a very strong team who have shown all year that youth can be a virtue. Bringing in talent from the local universities, Leeds managed to come up with Manchester at Tour 1 and have stayed in the top 16 so far. Rich Hims has been making plays all his career for LLL, and sets the tone for a young squad who don’t lack in legs (although rumour has it he may be playing Mixed therefore ineligible for Regionals). Ben Bruin keeps the offence ticking over with solid throws and good speed, whilst Chris Rodd and Sam Rayner keep picking the legs up to threaten any D. Having lost to Manchester 3 times this year, they will be determined to make sure they stop the rot and give themselves a chance. Vision have bled their best talent to their competitors in the past few seasons (Liam Kelly, Sion Regan and Paddy Hart to Chevron, Manchester and EMO respectively) but have always been focused on bringing through local junior talent and giving youth it’s chance. They have always been a passionate team with a lot of fire, but have always struggled to retain depth to the squad and having lost the voice and wisdom of Mark Cooper and Mark Ansdell respectively this season they have relied on some newer faces to get the job done. Paddy Hart looks to control the offence with big throws and has willing runners in Pete Garnett and Dave Baxandall. Alex Walsh and Ben Smith Richards came through the GB Junior ranks together and possess pretty throws capable of hurting defences. Having secured a headturning sudden death victory over LLL in 2012 to secure a Nationals berth, don’t put anything past them in 2013. Filling out the field is Black Sheep 1 & 2 who have spent the season growing as a team and splitting relatively evenly in Tour events (featuring in the C Tour). They will be approaching the tournament with a view to learning and growing further, with a set of games against the region’s top talent sure to boost them as a club in the future. With the schedule just released, it appears the crunch game comes down to Manchester vs Leeds in the group stages. At this stage, it is unclear if both teams will elect to carry the result from the Group stage or potentially replay in the 2v3 (assuming Vision don’t cause another upset) but with a place at Nationals on the line for the victor, expect a dogfight. With the results this season in Manchester’s favour (15-10, 15-10 and 15-13 respectively all in crunch games) the smart money would be on Manchester joining Chevron in Southampton. I’m sure the smart money would have been on LLLeeds joining them last year. What do you think? Tell us below, on FB, Tweet, email, ask away! DP @ tSG. Dale Walker continues our London’s Calling review week with a look at B tour. 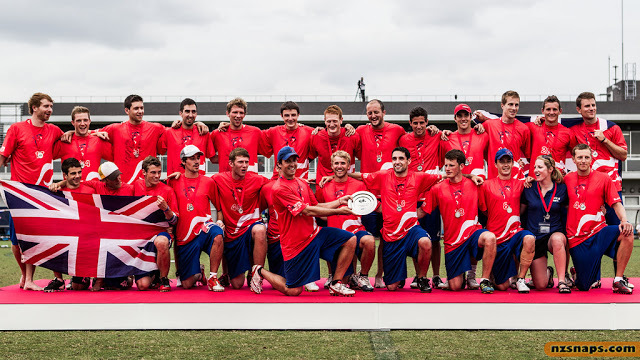 As UK Ultimate continues to grow and develop with the standard improving across the board, the stigma previously attached to being a B Tour squad looks less offensive in light of a competitive opening Tour of 2013. Perennial A Tour teams including LLLeeds, Burro and Fusionbattled with new kids on the block Manchester, Glasgow, and JR – not to forget yo-yo teams like The Brown and Cardiff, programmes from Vision (with their strong junior setup) and Bristol (one of the deepest Ultimate communities in the UK) and we had a truly wide field for the first time in years. Manchester came into Tour the #1 seed having jostled with a few for an A Tour berth beforehand, but with strong credentials from a few (including a stacked Zimmer team featuring GB legends Dave Sealy, Si Hill & Matt “Bob” Hims) this was always going to be the scrap it proved to be. 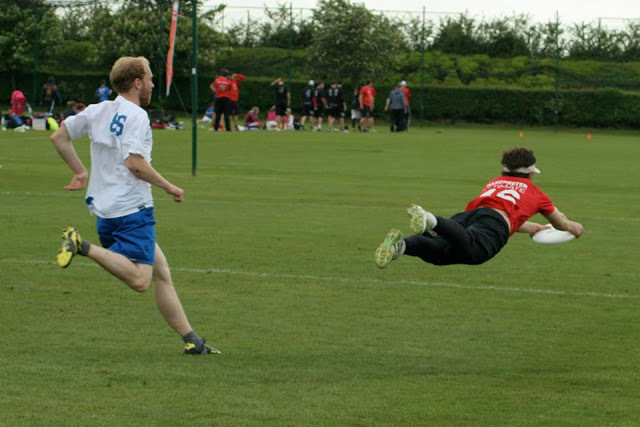 Santiago Zuluaga (Manchester Ultimate) goes big for an offence point in the Saturday pool game against LLLeeds. Photo courtesy of David Sparks. Bar Pool J, each pool featured one team who were knocked out of contention having started the weekend seeded in the Top 8 bracket – the unfortunate 3 being The Brown, Cardiff Storm and Fusion – demonstrating the difficult nature of seeding at the start of the season and the topsy-turvy nature of Tour. Rumours had been spreading across the field about the various strengths of some of the contenders – Zimmer had been beaten on Saturday by EMO2 which shocked a few. Ireland U23, who featured a number from the successful Irish university scene of 2012 & 2013 looked to sail into A Tour to get the best preparation for Toronto. JR had a successful 2012 building on a strong programme from the universities, finishing in A Tour in 2012 and fancying themselves another shot at the big time. The Quarter Finals on Sunday morning saw Manchester take on Brighton 2, LLLeeds against Ireland U23, Glasgow battle with Reading and Zimmer hope JR ran less than them… the only upset here was perhaps LLLeeds dispensing of a hyped Irish team in their QF to earn a right to play Zimmer in the SF, the rest going to seed. The Semi finals saw Manchesterand Glasgow – both new geo programmes in their respective cities – go head to head whilst LLLeeds and their young squad played a team at the opposite end of the spectrum in Zimmer. A sudden death nail biter between Mcr and Glasgow saw the Scots come through, whilst Zimmer dispatched the young upstarts at Leedsdemonstrating their wisdom and experience. B tour movers. Courtesy of Wayne Retter. The Final would see Zimmer take the B Tour crown in a close fought 15-13 win over Glasgow, who had demonstrated over the 2 days that they are an unassuming team who will only look to grow in coming years lead by the experienced Webb brothers and working closely with the local university talent. Similarly, Manchester and LLLeeds had revamped in 2013 with similar aspirations and development plans, but in their 3/4 game-to-go Manchesterdemonstrated their extra experience and quality to close out a 15-10 victory and take the final A Tour berth. In previous years, so-called yo-yo teams seemed to come up every Tour and head straight back down a Tour later without really putting up too much of a fight. The depth of the competition is a lot stronger in 2013 – consistent A Tour squads of the past few years are now struggling to come back up, teams are running large rosters reflecting their A Tour contemporaries and using tactics and ideas pioneered by the strongest clubs in the country. Whilst the top half of the division featured some close games, the standard really dipped beyond a certain point and resulted in some really falling off the radar. The top 3 teams were spread by three points (11-10 to Glasgowover Manchester, 15-13 to Zimmer over Glasgow) but the level beyond that seemed to dim. Speaking from a personal perspective, Manchester convincingly put LLLeeds away twice by a 5 point margin and took Vision and Burro to the sword (15-5 and 15-8 repectively). Whilst B Tour has come a long way, it still feels as if some games for the more established squads would be more beneficial if Tour 1 allowed for crossovers into A Tour on Sunday. 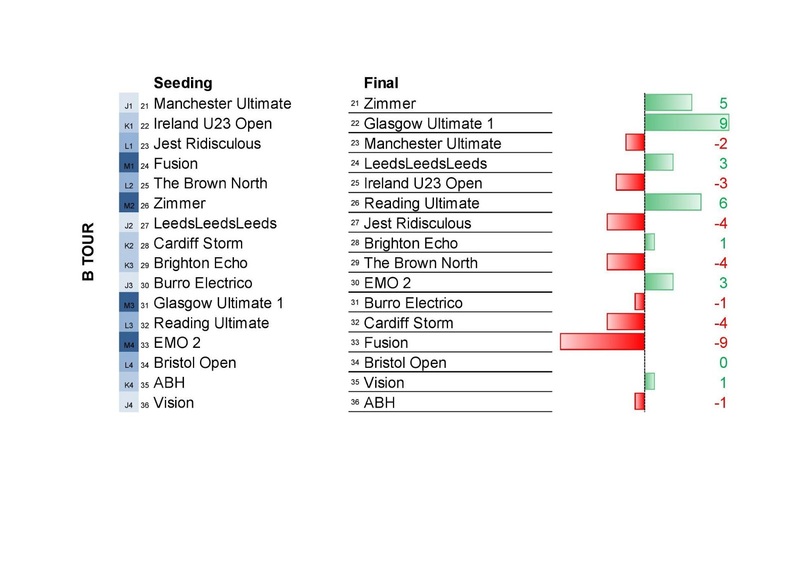 The weekend saw some massive seeding swings, with Fusion nearly falling through the trapdoor and Glasgowrocketing to A Tour after being underseeded coming into the weekend. Reading showcased their growing programme with a strong showing resulting in a 6 place rise whilst Cardiff, JR and The Brown all have their work cut out after disappointing showings. With Zimmer considering not entering Tour 2 and Rebel not entering due to its proximity to Windmill Windup, the teams promoted to A tour are yet to be revealed, but perhaps this year we will see some new faces upset the established order. With Devon, Cambridgeand Tooting all finishing in the historic relegation spots from previous years, the 9-20 bracket could see some real chopping and changing during the season – and those coveted Top 16 places look to be more fiercely contested than ever before. Watch out for Dale and his team (Manchester Ultimate) along with the new promotions to the A tour in a couple weeks! More reviews tomorrow @ tSG. Josh Coxon Kelly reviews the primary domestic warmup for the club open season. Last weekend saw the second ever Fog Lane Cup take place at Stanley Lane Sports Ground in Chippenham. A stiff but unpredictable breeze and occasional rain made for testing conditions, and an opportunity for teams to break in rusty winter skill sets and new tactics alike. Pool stages on Saturday saw two upsets from Fire 2, who showed grit and tenacity to come out with sudden death victories over both Kapow and Devon, earning themselves second in the group and a hard fought semi-finals berth. Chevron won-out, although not without fight from their opposition, which included a Kapow team hungry to improve on a tense 15-13 quarter final loss at 2012 Nationals. The London outfit were unable to improve upon last year’s effort however, and Chevron proceeded to top the group. The other side of the draw saw Fire 1 and GBU23 in a battle to top the group on Sunday morning. After dispatching EMO and Devon 2 decisively (both games got to score cap at 15-2) the Under 23s had made their statement and were ready to take their first scalp as a new team. However they found themselves up against an experienced Fire squad who, unflustered by the GB unit took an early lead, and held out for the win. GB didn’t stay dejected for long however, and made their way past Chevron in their semi-final for a chance of victory at their first ever tournament. In a game that was not lacking in familiarity between players (no less than 9 of the full U23 team are part of this year’s Chevron squad), the game nevertheless saw an exciting and fiercely competitive matchup, as both teams tested the opposing offences with an array of defensive looks. Both teams showed an ability to work the disc upwind from the first pull, with GB earning an upwind break to start. Chevron replied with a break of their own, but eventually the GB D-line brought a strong that proved too strong for the Chevron rainbow. Trading stopped after the first half as GB became increasingly efficient at converting their turns as they took the momentum for the second half against a stuttering Chevron, and eventually the game. Fire fought Fire in the other semi-final, in a training ground match-up for a final spot. Fire 1 commanded an expected lead early on, and despite a late surge from Fire 2 (characteristic of their performance throughout this tournament), they were unable to repeat the comebacks of the previous day against their first team. With Fire 1 now down to 9 men due to injury, permission was given by the TD for the two London squads to join forces to take on the GBU23 once again. With the earlier result still fresh in both teams’ minds, both sides were fighting for something in the final – Fire for consolidation of their earlier victory, and GB for vengeance. Despite a strong start from both, it wasn’t long before the game was slipping from the Fire squad. With the largest squad of the tournament at 21, GB didn’t waste a body as they brought a combination of athletic defence on the pitch and full-squad noise from the sideline, mounting an all-out assault on the Fire Offense. This time it proved enough, and the GB D-line showed the dominance of earlier games to take the game away convincingly 13-6. 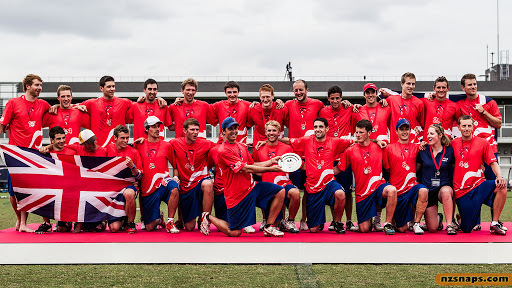 The GB team succeeded in winning their first tournament together, and they will look to continue this winning form as they compete in the coming Open Tours 1 and 2, and finally in Toronto this July. In terms of club it was a tournament of statements. Fire 1 and Chevron topped the pack after GB, but did not yet find themselves in a rematch of last year’s National semi-final. The two teams will almost certainly meet this season, but at what point? With such a short preview of the coming tour season it’s difficult to make predictions, but this weekend also suggests that Manchester Ultimate are looking to overtake northern rivals Leeds in their pursuit for a top 8 A-tour position. Kapow are clearly out to prove right many people’s suspicions that they can run with the top teams in the country. A tour regulars Devon, EMO and Leeds have shown that they are all preparing hard for the coming season, but will they be able to hold off the ever increasing competition from new teams? With the inclusion of GBU23 as well as European teams at London Calling, it looks like we’re set up for an exciting start to the open season regardless. Note – some of the final games were rearranged to avoid replays, hence final positions. Dale Walker gives us his opinions on the state of Ultimate with respect to the UK’s geography; particularly the North vs the South. Over the past few months, I’ve seen a number of Ultimate-centric blogs come out onto market. Something struck me about all of them – none of them really provided a true opinion piece about a particular topic, concept or something wider spread than personal fitness notes or musings about a particular team’s performance. I can’t say I’ve read them all, but having been an avid reader of some of the commentaries by SkyD writers (Lou Burruss & Ben Van Heuvelen spring to mind) over the past few years there’s definitely been a lack of true content for the British reader. With this in mind, and having attempted my own commentaries a few years back, I wanted to write a piece about not only one of the issues in British Ultimate but something that reflects upon the wider workings of the 21st Century United Kingdom – the North/South divide. I have been playing Ultimate since 2004 and never really felt the need to venture further South than the M60 to fill my competitive and social fix for Ultimate. The career path I wanted could be undertaken anywhere in the UK, and I am not so dedicated a player that I felt the need to relocate to get my fix (appreciating the vibrant London scene). However, naturally Ultimate careers have always been tied into people’s career paths and I would be hard pressed to name players who haven’t taken a step forwards in their professional career out of loyalty to their Ultimate team. My favourite examples of this are some of the leading US players of the past 15 years – Seth Wiggins and Ron Kubalanza – who seemingly have played for more teams than I can make reference to (including but not limited to Sockeye, JAM, Furious, DoG, Rhino, Revolver) through what I can only assume is closely tied to their chosen careers. When I first attended Tour events circa 2006, I distinctly remember a Tour final in Bristol being fought out between LLLeeds and Clapham back in the days when LLL could boast Christian “Wigsy” Nistri, Steve Vaughan, Jamie Cross, Rik Shipley and Rich Hims amongst others. In it’s heyday, that was some team – Fire if I recall had just come onto the scene and Chevron were still in a phase of playing with exclusively their mates (which perhaps came to an end at roughly the same time) so LLL were the main competition to Clapham. If you take a look at that year’s Tour results overall, you’ll see that the A Tour featured LLL, Chevron & Sheffield Steal in what was a period of relatively rude health for Ultimate in the North. Prof. Dorling, University of Sheffield’s UK divide. So what conclusions can you draw from this? Chevron have always been perennial contenders for the top table, and beyond that the rest have been heavily dependent on what talent stays in the area post graduation. I wouldn’t want to comment on the entirety of the decline of Leeds, but to go from a European power to struggling to get back into the Top 16 is a real shift in stature. Sheffield Steal, whilst not the same powerhouse, were an established club able to field two squads – to have dropped 41 spaces is remarkable. The Brown at the time were starting to establish themselves, and you can guarantee that every year the same faces turn out for them demonstrating a consistency of personnel. That’s 4 teams that didn’t exist 6 years ago all placing in the Top 16, and the 4 that did boasting an accumulative ranking difference of +4 places. Compare that to the North with 2 new teams and a difference of -28 places. Further to these 8 teams against each other, if you consider that Fire 2 ranked in the top 16 at Tour and Burro Electrico made Nationals, there’s an argument that even the depths of the SE would come out favourably against the best the North could offer. Whilst compiling this information, I was intrigued to see how the numbers worked out after I had looked through the rankings and I was taken aback by the drop the North has suffered. Of course, there’s an exception to every rule (ManUP finished 11th at Nationals in 2012, beating Wessex & Burro Electrico along the way and pushing teams like Kapow and Devon hard) but you can quite clearly see that the regions are on different trajectories in terms of performance. When people are making their first steps into their careers, there is no doubt that the most buoyant job market to be found at present is in London and the South East. I read recently that London as a geographic area has been out of recession since 2007, and the poor economic forecast for the UK comes from outside the M25. This naturally has a massive knock on effect to Ultimate’s amateur players. Of course, there are other programmes that do a great job being competitive at the top table whilst being outside Greater London (EMO & Fusion, for example) but it would be interesting to see how these teams would be affected if their stalwarts who have built their lives in their respective areas retired or moved on. Recent “graduates” of these teams are now some of the top players in the UK – examples include Tom Abrams (formerly of EMO, now of Clapham/GB World Games). This makes for a stark contrast with the USAU Championships, where in the past 10 years we have seen winners from Seattle, Vancouver, two teams from San Francisco, Atlanta, Austin & Boston – compare this to the UK, where Clapham have won Nationals for over a decade. Is this lack of diversity a hindrance? Is the spread of talent too heavy to one area? 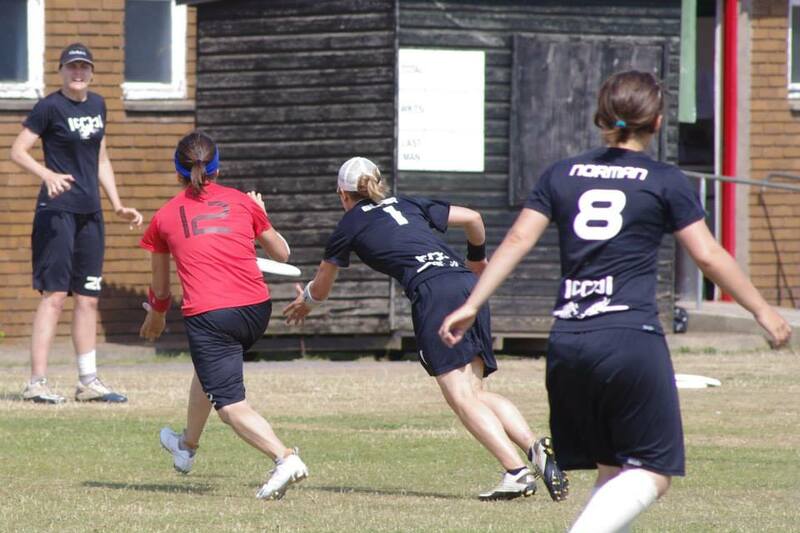 Coming off arguably GB’s best ever international performance with GB Open winning silver at WUGC 2012, the argument can be made that we’re in the best shape possible which is hard to disagree with. That said, the Open squad featured 14 players based in London/the South East (with all bar one playing for the afore mentioned teams). The final 2013 World Games Squad features 10 London based players, and upon initial invite to trials applicants were told to expect to train “like a club team in London” – even if I were at the level to be a serious applicant, would I commit 75% of my weekends to being in London? As long as Ultimate remains an amateur sport in the UK, this is unavoidable. No-one is tied to a contract (I’m infact interested to see what lengths the UKU would go to should someone mid-season decide to jump ship with the support of the beneficiaries), and if talent feels that they have the chance to win somewhere else unfortunately no-one can stop them. What the rest of the UK needs to do is open to debate, but to this writer the only course of action that could allow teams to remain competitive is to continue developing their programmes, work closely with the local universities/schools, and make sure that when players are making that next step in their lives that they know the region they’re moving to has a team that can support what they want out of Ultimate. How much of a deciding factor Ultimate is in people’s choices is questionable, but for those “floating voters” who are just too far for one team but maybe close enough for another (or infact feel their local team cannot provide their fix) the lure of London and the affluent SE Ultimate region might just sway their decision. N.B. 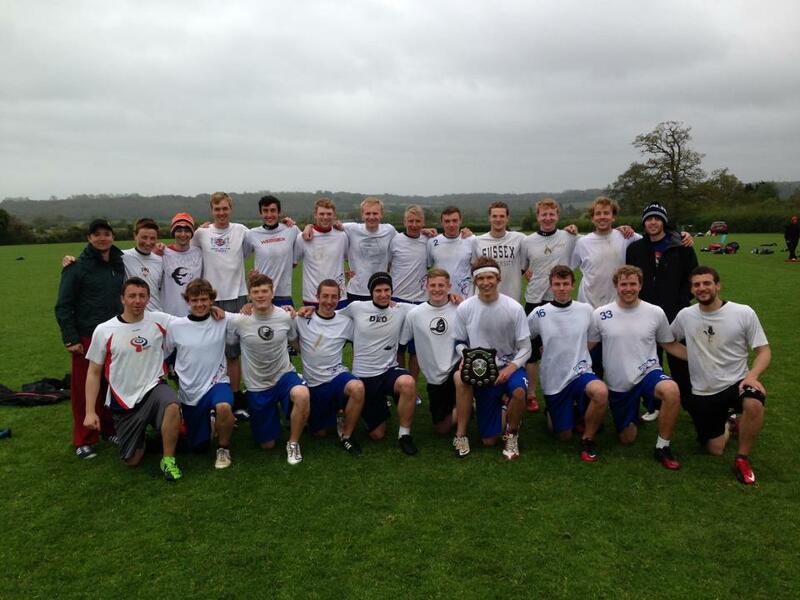 this article was written before Fog Lane Cup and University Nationals which saw some promising results from Northern teams – MCR Ultimate finishing 4th at Fog Lane & Manchester/Sheffield universities making Top 8 at BUCS Nationals respectively. What do you think? Please comment, tweet, like and share. Or rather write about your opinion? 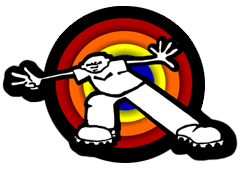 Send your musings to showgameblog@gmail.com.